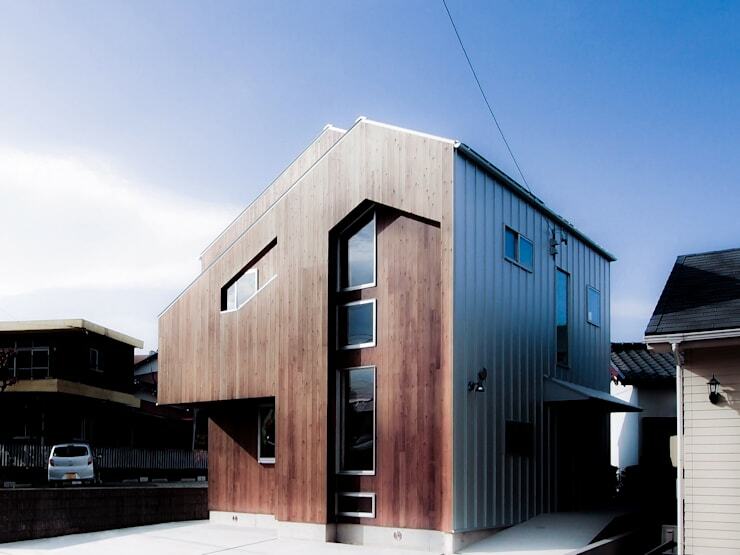 This award-winning contemporary Japanese home possesses a bold facade and a humble interior. 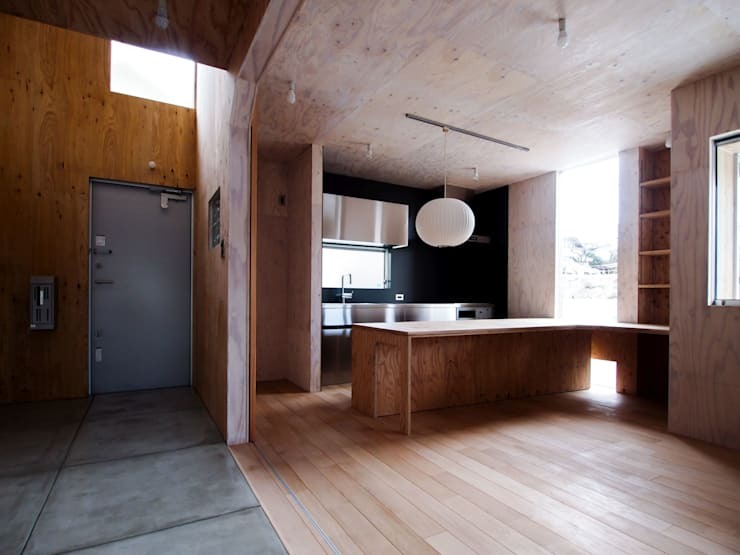 As with many modern Japanese homes, it is made from wood and designed with a minimalist sensibility. The owner requested lots of open spaces, easy functionality and decent storage space for household goods. At the same time, the family wanted an interior decor that would work well with their antique furniture. Architects Atelierorb accepted the challenge and created a dwelling of 85.33 meters square spread over two levels and a loft area. That calculates to be just 43 meters square on each of the first two levels. It's not much room for a space that also manages to fit in a two-way staircase. But this is a small home with big ideas, including a plan to use the element of spatial contrast to increase the sense of spaciousness in the home. To see how this unique home has been envisioned, come with us on a photo tour and explore this incredible home. 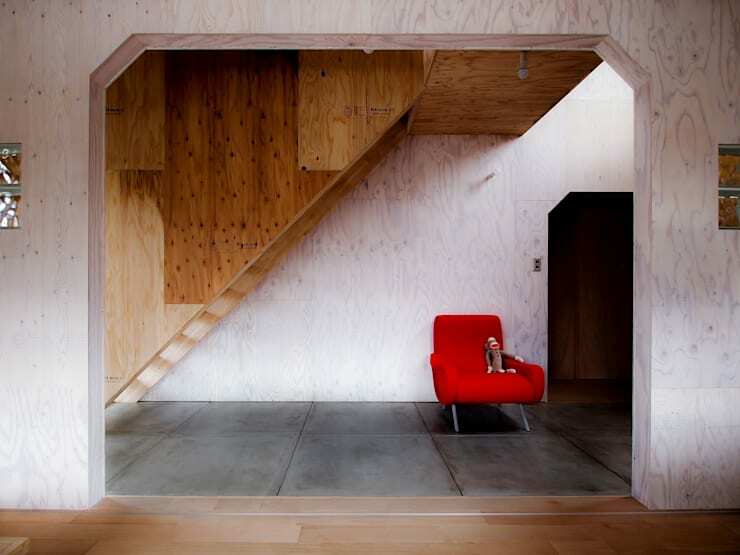 One of our favourite features in this house is the bold timber facade. The double envelope construction was inspired by the push-pull operation in 3D modelling software. It allows for a great deal of privacy on the second and third levels without compromising on the aesthetics. In contrast to the rather impressive facade, the interior of the home is unashamedly humble. The aesthetics of the Wabi-Sabi style are apparent in the humble unvarnished and raw surfaces. 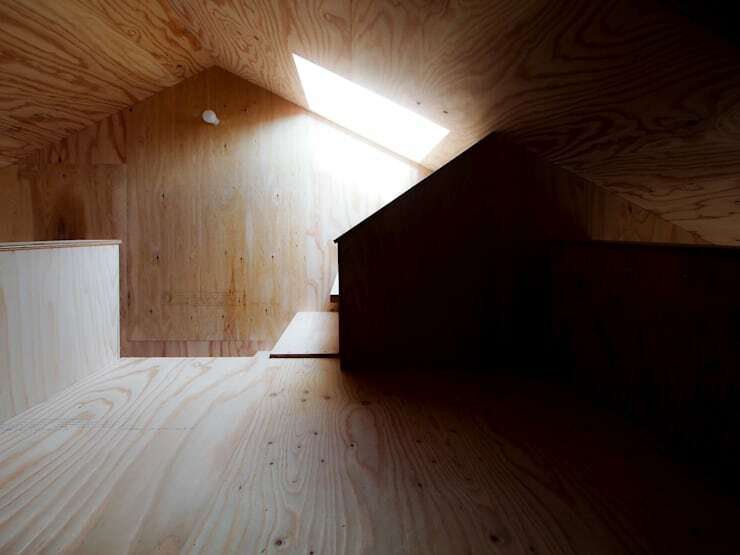 Plain plywood panels have been used for the staircase and the walls. A polished cement floor has been used for a completely pared back look. This simple, humble approach was not just an aesthetic choice, it was also a practical one. 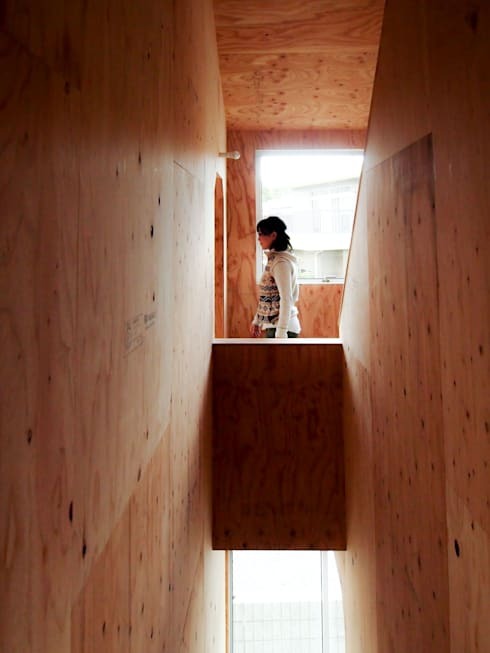 The architects said that standard size building materials were used to reduce costs. The owner had requested lots of open spaces and this open plan kitchen and living room certainly delivers. A muted colour palette has been employed and there is little ornamentation. Instead, the kitchen possesses stainless steel appliances, a grey-blue wall and built in wooden kitchen furniture. Aside from this, all we have is a simple white light fitting and vast expanses of natural wood floors and walls. The designers said that they were aiming for a peaceful and internal contrast to the fortitude of the exterior. They cited the owners need for a very private sanctuary in which to relax. It's not often you see a transitional space built with such singularity of vision. 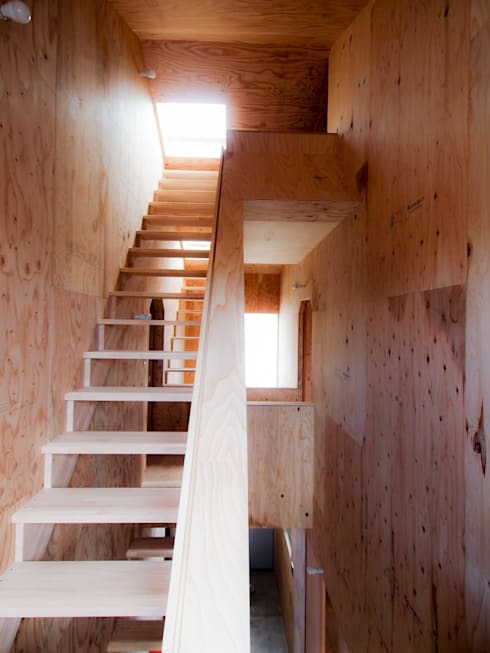 This 2-layer staircase is made entirely from plywood and sandwiched between two walls. The stairs lead from the first to the second floor and then the loft area. There was some concern that the area might feel claustrophobic or closed within such a small layout. To compensate, a light window was placed at the top of the stairs on each level. The result is an area rich in light and shadows. All this is of course highlighted through the use of a single material for walls, stairs and bannisters. The transitional areas of the home have been carefully considered to provide contrast. The passageways are narrow so that when the inhabitants move into the open plan areas, they might feel a heightened awareness of the larger space. The designers envisioned that the contrast might encourage the inhabitants to feel as though they are passing through a naturally wooded area. For our final photo, we'll take a peek inside the loft. This area is just 12.47 meters square, and yet it feels like a cosy and spacious area. The owner had requested lots of space for storage. While this would be perfect for storage, we imagine it would also be a delightful crawlspace for young children to play. If you are interested in Japanese design, you will love this Ideabook A Delicately Refined Japanese Home. What do you think of this bold home with a pared back interior? We'd love to hear in the comments below.